Levitating is a valuable skill when you live above a portal to hell! 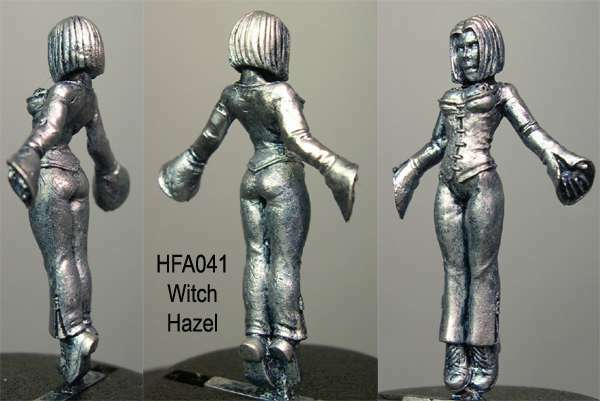 This willowy-framed young witch has been sculpted in a pose that could be defined by the painter as either a good or bad character depending on what was required at the time. I personally see her as a red-head. Her height from the tip of her outstretched boots to the top of her head is approximately 31mm When not levitating she can be found as part of a gang along with her best friend Sadie (HFA019) and Sadies secret admirer William (HFA066). Although Kev hasnt yet sculpted a female companion for her, HFH030 Miranda fits the bill quite nicely.